Papers in Palaeontology is a continuation of Special Papers in Palaeontology and includes papers that document the diversity of past life and its distribution in time and space. As a sister publication to Palaeontology its focus is on descriptive research, including descriptions of new taxa, systematic revisions of higher taxa, detailed biostratigraphical and biogeographical documentation, and descriptions of floras and faunas from specific localities or regions. Subscribers to Palaeontology will also have free online access to Papers in Palaeontology. Gold open access is an option available to authors on payment of an article processing charge (APC). 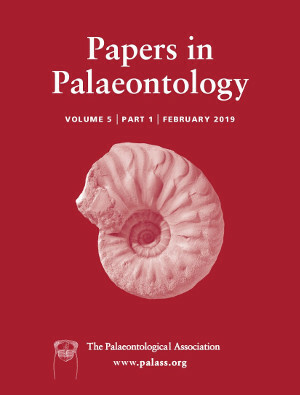 Members of the Palaeontological Association have free access to all content, and also have the option of a print subscription as an additional membership fee. Thinking of publishing in the journal Papers in Palaeontology? If so please read our guide to publishing within our journals (covering: how to submit a manuscript; initial assessment; editorial decision; production; copyright and open access; offprints). Note that the same submission site should be use for both Palaeontology and Papers in Palaeontology and all papers will be considered for both journals. An initial assessment of the manuscript is undertaken by the Editorial Board, usually within two days of submission. The Editorial Board may also recommend that the scope of the paper is more suitable for Papers in Palaeontology’s sister journal Palaeontology. In this case, the corresponding author will be contacted directly and the paper may be transferred without resubmission. Currently, the journal receives many more articles than can be published in a year. Papers that lack novelty, or are too restricted in their scope, will be rejected without review. Those dealing with one or a few new taxa belonging to well-documented groups are unlikely to succeed. Authoritative synoptic taxonomic revisions of new faunas/floras of biogeographical, stratigraphical or palaeoecological importance are welcome, as are detailed descriptive studies of new or poorly understood taxa so long as their significance is made clear. This should be stated clearly in a covering letter, be obvious from the abstract, be developed in the introduction to the paper, and explored in the Discussion. A paper may also be returned to the author without review if it has not been prepared in accordance with the Instructions to Authors, or if there is room for linguistic improvement. A list of independent suppliers of editing services is available from Wiley Author Services. All services are paid for and arranged by the author, and do not guarantee acceptance for publication. If the Editorial Board recommends review, the paper will be passed to a Scientific Editor who will manage the peer review process. A decision on whether or not to publish the manuscript will be made in the light of the comments of at least two referees, an assessment of the technical aspects of the paper (including style and figure formats), and the opinions of the Scientific Editor and Editor-in-Chief. The corresponding author will be notified. The Palaeontological Association asserts copyright on all articles and images in its electronic and print publications unless otherwise stated. Articles or figures in the journal Palaeontology may be reproduced in print or electronic medium for teaching, and for non-profit educational and research purposes, without fees or further permissions, providing that acknowledgements to 'The Palaeontological Association' is given, and that the source of the reproduced material is quoted in full. The Palaeontological Association reserves the right to withdraw this permission without notice. Written permission is required by the Association for all other forms of capture, reproduction and/or distribution of any of its publications or items in its publications. Permission should be sought from the Executive Officer (executive@palass.org).